By John Hertz: (reprinted from Vanamonde 1154) In fact I’ve met Grace Slick, alive as you or me. She was born in the Year of the Rabbit, she’s been painting, and her birth surname was Wing. I’ve met Joan Baez, who sang “Joe Hill” at Woodstock and whose Antioch degree is different from mine. But I don’t want to get too far from the Lewis Carroll masterpiece Alice’s Adventures in Wonderland, establishing him as a master, published to the wonder of us all, the enrichment of the Imagi-Nation, and the benefit of humankind 150 years ago this month. Through the Looking-Glass (1871) came later, although I’ve seen one of Ms. Slick’s paintings with both, likewise “White Rabbit” and Walt Disney’s “Alice in Wonderland”, and although my mother says I learned to read at about age 3 (you also may’ve been reading then) by making her read Looking-Glass aloud until I was reading it with her. And, she sometimes says, correcting her. Humph (not to be confused with Humpty-Dumpty). I don’t remember that part. But it’s a poor sort of memory that only works backwards. This month’s Alice has never been out of print. It’s in almost two hundred languages, e.g. Basque, Chinese, Esperanto, Finnish (4 translations), Hebrew, Hungarian (3 translations), Japanese, Latin, Polish (8 translations), Russian (7 translations, one by Vladimir Nabokov), Serbian, and Swedish (11 translations) which holds the Celerity Honor (wups! there goes half my readership – hey, you! wake up! get a dictionary! don’t be a vegetable!) having started in 1870; there’s a Shaw Alphabet text too. It’s full of reference jokes, most following the best practice, fun if recognized but undaunting if not; e.g. Ambition, Distraction, Uglification, and Derision in Chapter 9, or digging for apples in Chapter 4 (“apple” in French is pomme, and pommes de terre are potatoes). Some things well-known in its day may call for help now – e.g. bathing machines in Chapter 2, which aren’t like Chapter 4 of Between Planets. 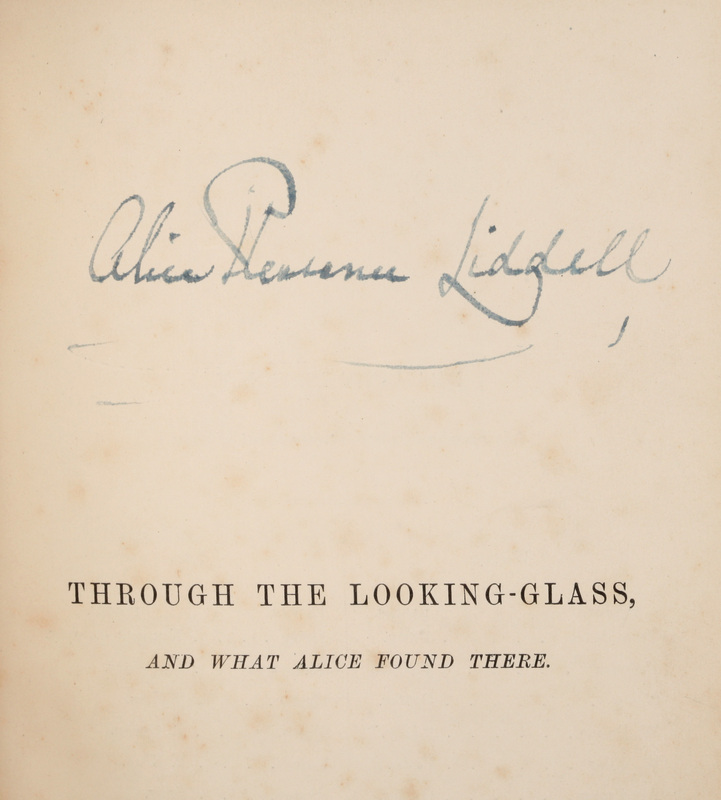 Hosts have illustrated one or both of the Alice books. I remain partial to Sir John Tenniel. What besides wit and satire (sarcasm is in anger, satire is with love)? The story line is punctilious, from tears to a thimble, from a caterpillar to a cat, from a duchess to a dormouse to a dance to a decision; the verisimilitude is careful, from the best butter to the head-downwards lizard; the characters – don’t say they’re cardboard – look at the rabbit with his servants and his King, look at Alice as she grows – never mind her body size, or compare Chapters 2 and 12. There’s beauty and vanity. The pack-of-cards moment is worthy of Bleak House or The City and the Stars. Both those protagonists, it must be said, were rebuilders. But that is not the canvas on which our author chose to paint Alice. Might Wonderland in the strict sense – if those words apply – be no fantasy, since it’s only a dream? Might it be science fiction? Here again is Sturgeon’s Apothegm (hey, you!) Science fiction is knowledge fiction. Or perhaps the science is mathematics – especially if that includes logic – or is it the other way round? – more than half being edited by Leslie Turek, who chaired Noreascon II and any minute now will be Fan Guest of Honor at Sasquan – to which we gave a Hugo. Is this a book for children? The author himself said it was. Unlike the Hatter, although I may be mercurial, I don’t deny it. But we don’t relegate to children the sense of wonder. On the contrary, we pursue it. There’s glory for you. 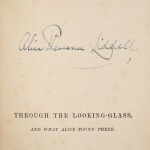 The first edition, dedication copy of Through the Looking-Glass, and What Alice Found There, presented to the original Alice by Lewis Carroll, fetched $115,000 at a Profiles in History auction on December 16. 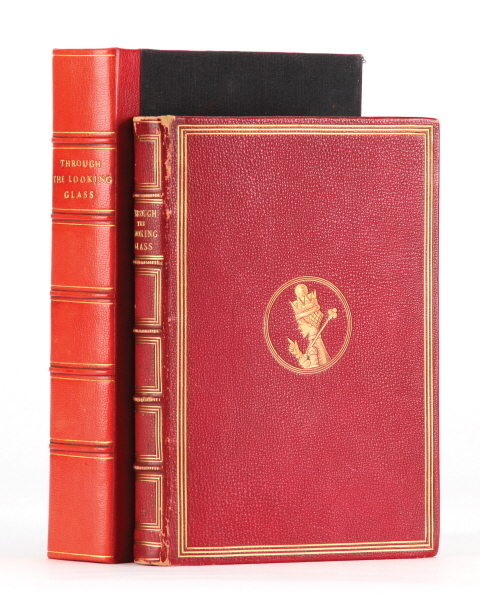 Another first edition of the book that also came with two fine original pencil drawings by John Tenniel of Alice and Humpty Dumpty sold for $46,000. The auction was full of items science fiction and fantasy fans would love to own. 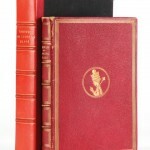 Beatrix Potter’s personal copy of The Tale of Peter Rabbit went for $92,000; The Wonderful Wizard of Oz, First Edition, first state of the text and first state of the plates, cost a bidder $51,750; and The Time Machine: An Invention, first edition, presentation copy inscribed by the author, H.G. Wells, brought $25,875. Inklings fans would have needed deep pockets to take home The Fellowship of the Ring, first British edition in dust jacket: its new owner paid $11,500. The Lion, The Witch and the Wardrobe, with a tipped-in autograph letter about Narnia by C. S. Lewis, was a comparative bargain at $9,200. Diana has wanted a Lewis autograph for years, but more becoming of Scrooge than Peter and Susan, just before the auction I blew the family fortune on a used 2007 Camry.